Not to be outdone by KLIV-AM 1590 (see below), the Mercury News has begun offering free classified ads. 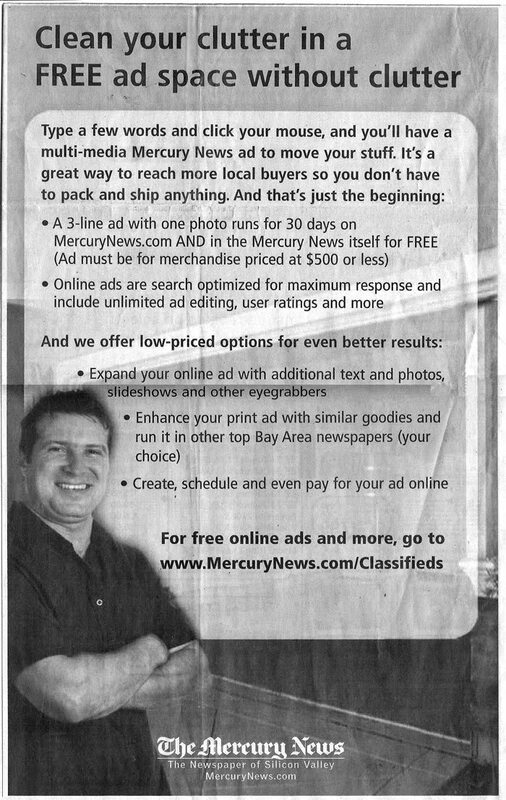 “A 3-line ad with one photo runs for 30 days on MercuryNews.com and in the Mercury News itself for FREE,” the house ad says. The ad must be for merchandise at $500 or less. Obviously readers are being targeted rather than businesses. Maybe the Merc has offered free ads before, but we’ve never seen it. And who is the guy in the ad? "Mr. Tully. It's John Fry on Line 1. He wants the free ad deal for Fry's."